It all started last year with a Facebook post, asking what everyone was doing for charity during the holidays. 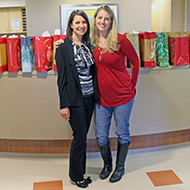 For the second year in a row, Amy (along with around 20 of her friends) put together gift bags for new parents at the Doerr Family Newborn Intensive Care Unit. But she and her friends weren’t the only people to go out of their way recently to touch the lives of our patients. When Cheryl Halverson was diagnosed with breast cancer, she was shocked and scared. Fortunately, she had Peggy Long, her Nurse Navigator, by her side every step of the way, at every appointment. Cheryl says she wouldn’t have been able to get through her cancer treatment without Peggy’s endless support and encouragement. These compassionate caregivers are a shining example of Columbia St. Mary’s Passion for Patient Care, and they will be the focus of this year's A Passion for Fashion Luncheon and Fashion Show. This year, Columbia St. Mary’s is making a bold promise. 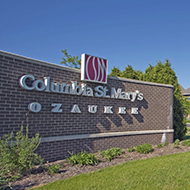 Starting in February, the Emergency Department at Columbia St. Mary’s Hospital Ozaukee is instituting a 30-minute guarantee. That means within 30 minutes of checking in, you will meet with a doctor.